Mr. S Patro, Mr. A. Bhingare, Mr. Anoop K.S. This is the Prime Magnetic Observatory. It was established in April 1904 as a successor to Colaba Magnetic Observatory, Bombay. It is located on the West Coast of India away from the influence of the equatorial electrojet. The two historic non-magnetic buildings, one for housing the magnetometers, measuring the continuous daily variation recordings and the other for absolute measurements, built completely with non-magnetic Porbunder sandstones, brass or copper fittings. 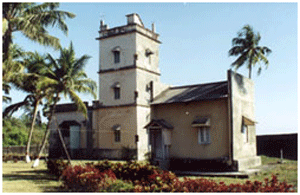 Alibag acquired the status of an INTERMAGNET observatory since 1997. Alibag being a coastal station, magnetic recordings are influenced by the induced oceanic currents from the Arabian Sea. ABG is a calibration centre for magnetic compasses of Indian Navy, Airforce and serves as a base station for a marine magnetic survey carried out off Arabian Sea coast.